You will receive unlimited 2×6 inch photo strips during your contracted photo booth rental time. You can designate whether you would like each of the photos to be either in color or in black & white. Does the photo booth print out photos on the spot? Yes. Two photo strips will print out about 20 seconds after the pictures are taken in the booth for your guests to take with them as a keepsake. How does the online photo gallery work? Within three business days of your event, all of the photo booth pictures will be posted on our website photo gallery and can be password protected. You and your guests can view them and purchase additional copies of the photo strips as desired. Are your photobooths made of cloth like many I have seen? No. 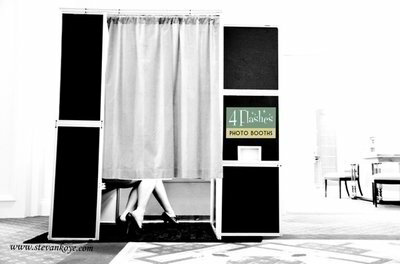 Our photo booths are professionally designed and constructed with hard panel sides, floor, and a ceiling – not fabric. These portable, self-contained, photo booths have the look and feel of a traditional booth and can be placed almost anywhere. Our cutting edge set-up will make your guests look supermodel and rockstar good. We think our clients deserve a true professional photo booth experience and not a makeshift fabric photo tent. What are the technical requirements to have your photo booth at our event? Our booth has a footprint of 4 x 6 feet and requires a 110V power outlet. If your event is located outdoors, we will need weather protected spot if precipitation occurs during the course of the event. Is there an extra charge for you to set the booth up and tear it down? There is no extra charge. For example, if you have a four-hour event that lasts from 7 pm to 11 pm, the booth will be set up and ready to go at 7 pm and we will begin to tear down at 11 pm. Will someone be on-site with the photobooth? Yes. There will be one or two full-time photo booth attendant to assist guests and to make sure the booth operates properly throughout the event and to help with the photo strip guest book. How do we reserve the photo booth? We require a $200 non-refundable deposit and a signed contract to reserve the photo booth rental. This will guarantee your date. The balance is due 10 days prior to the event. How does the photobooth provide party favors for guests? Your guests keep all of their photo strips. Your event logo or message can be imprinted on all the photos. These unique favors will leave a lasting memory and add a personal touch to your event. Your guests will enjoy their photo strips long after the event has passed. What does the photo booth look like? The memory book was a nice touch. I show it off more than my wedding album because it is so much more personal and lighthearted. It really captures how much fun people had at our reception. I will be referring my friends to you. Thanks again. The photo booth was busy all night long for our daughters quinceanera! Pretty sure it was the first time 4 Flashes filled two Zip drives. The photo album kept by their attendant is a beautiful reminder of the fun times our daughter had with family and friends. Do You Have a Question? Connect with Us Today!